After a two day wait, the first performance reviews of NVIDIA's GeForce GTX Titan are finally rolling in. Lets take a look at a couple of reviews to see how NVIDIA's new GK110 monster performs. First up is TechPowerUp, which notes the card easily claims the title of world's fastest single-GPU solution. The site says the GTX Titan is 30 percent faster than a GTX 680 at 2560 x 1600, and 23 percent when averaged over all resolutions. The downside is that the card is obviously very expensive, and that a GTX 690 is still about 20 percent faster. The GTX Titan is more power efficient than a GTX 690 though, the card even uses slightly less power than the Radeon HD 7970 GHz Edition, while being well over 20 percent faster at the same time. Power consumption of the GTX Titan in non-gaming states is fantastic, better than any enthusiast-class card we've seen before, actually it's lower than the majority of cards on the market today. This further supports that GTX Titan can be an everyday graphics card that's ever ready for serious gaming. During gaming, power consumption is extremely reasonable, too. While it won't beat Performance per Watt of lower-end cards like GTX 650 and HD 7750, it is certainly more efficient than GTX 690, GTX 680 and easily surpasses HD 7970 GHz Edition in that metric. The GTX Titan uses slightly less power than HD 7970 GHz Edition, while being well over 20% faster at the same time. This efficiency is the foundation for the low noise levels of Titan, because less power consumed produces less heat, which means less work for the cooling assembly. 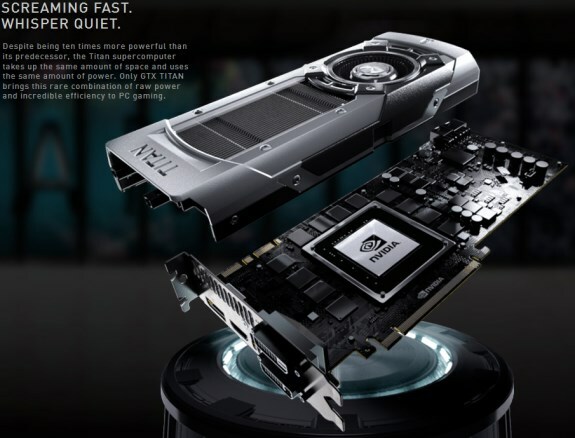 AnandTech writes the GTX Titan is in a league of its own right now, being world's fastest single-GPU card. The site says that even though the AMD Radeon HD 7970 GHz Edition can just match Titan at its very best, Titan really feels like it's nearly a generation ahead of the 7970GE. Titan is not fast enough to unseat AMD's and NVIDIA's dual-GPU cards, but AnandTech recommends to use single-GPU over multi-GU when performance allows for it as single-GPU always delivers a more consistent experience. With that in mind, as our benchmark data has shown, Titan’s performance isn’t quite enough to unseat this generation’s multi-GPU cards like the GTX 690 or Radeon HD 7990. But with that said this isn’t a new situation for us, and we find our editorial stance has not changed: we still suggest single-GPU cards over multi-GPU cards when performance allows for it. Multi-GPU technology itself is a great way to improve performance beyond what a single GPU can do, but as it’s always beholden to the need for profiles and the inherent drawbacks of AFR rendering, we don’t believe it’s desirable in situations such as Titan versus the GTX 690. The GTX 690 may be faster, but Titan is going to deliver a more consistent experience, just not quite at the same frameates as the GTX 690. For a third opinion you can head to PC Perspective, this site also awards Titan as being world's most powerful single GPU. The reviewer says it's anywhere from 20-60% faster than the GeForce GTX 680 and anywhere from 20-50% faster than the Radeon HD 7970 GHz Edition.